Off-Center Views: Us Against You: Is This Return to Beartown Needed? Us Against You: Is This Return to Beartown Needed? How do you feel about sequels? 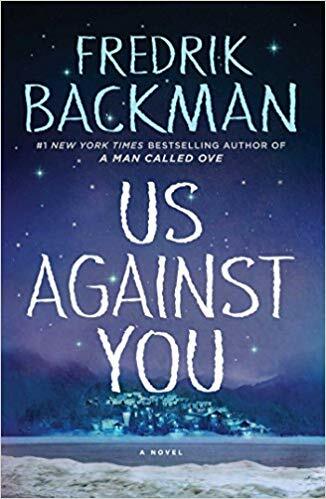 If you see them as the next chapter of an ongoing tale, you’ll like Fredrik Backman’s Us Against You. If you think they are recycling, you might not. Backman came from nowhere with A Man Called Ove in 2012, and quickly made his way onto my reading list. His 2015 My Grandmother Told Me to Tell You She’s Sorry is one of the most magical books I’ve read since childhood. I wasn’t quite as enamored of Beartown (2016), but it grabbed me about halfway through. If you’ve not read Beartown, don’t read Us Against You until you do, as it’s most assuredly a sequel and you'll need Beartown’s background and character development. Even then you may come away with the impression that maybe a sequel wasn’t needed. 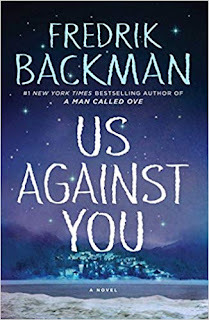 There are three major takeaways from Us Against You: Backman really loves hockey, rural Sweden is more violent than you imagine, and Backman thinks that family and community matter at least as much as hockey. Us Against You returns to Beartown, a postindustrial working-class town in a remote part of Sweden. It’s a place of hard times and hard people, unlike the nearby town of Hed, which is middle class and more prosperous. Those who stay in Beartown share the perspective of the mother of a talented hockey player: “Fatima loved the people here because they didn’t try to pretend that the world was uncomplicated. Life is tough, it hurts and people admitted that.” About all the town has going for it is a great hockey program and, if you’ve read Beartown, you know that even that isn’t as good as the one in Hed and is in severe crisis. As we come into Us Against You, it looks as if the Beartown and Hed squads will be consolidated as one–in Hed, of course. You’ll meet the same cast of characters: Hog, Tails, Sune, Ramona, Amat, Bobo, The Pack, and Benji and his sisters. At its center is the Andersson family: Kira, a lawyer; Peter, the general manager of the town’s hockey clubs; 12-year-old Leo; and 16-year-old Maya. Maya was central to Beartown, but now her plight has split the town. Some blame her for the impending demise of the hockey club; others are royally ripped that she’s being treated so inhumanely. The pressures on the Andersson’s marriage is acute, Leo is growing up lean and mean, and Maya increasingly withdraws into her music and her friendship with Ana. Packing boxes mysteriously appear on the Andersson property, and phone calls from moving firms they’ve not contacted disturb their privacy. Possible salvation arrives in the form of an ambitious politician, Richard Theo. He’s as oily as a sardine factory, but he has an enticing plan that will save the hockey team and bring new jobs to Beartown. This leaves Peter with the task of trying to reassemble a dispersed hockey team and defeat Hed in the process. The complication is that he must rein in The Pack, a group of local toughs who stand at hockey games like a Norse version of the Hell’s Angels. That’s daunting enough, but the fact that Peter would have to break his word sets up the classic dilemma between being safe and honest, or aligning with power and paying the cost to keep the hockey program. If you are tempted to shout out, “Oh for heaven’s sake. It’s just a bloody game,” the only part you’d be right about is the blood. You’ll meet a few new characters such as a tough-as-iron female hockey coach named Elizabeth Zackell, and Vidar Rinnius, a brilliant goalie who is the troubled younger brother of Teemu, the thuggish linchpin of The Pack. This novel isn’t what you imagine about Sweden and violence. You might also be shocked by what passes for okay among the adolescent males. In Us Against You, we confront situations that are as volatile as a dry forest. It won’t take much for things to ignite. Damage will be done to the degree that we must wonder if redemption is possible. The central question is whether we the readers are convinced that hockey is a profound metaphor for life. I love the sport, but it was a struggle to freight hockey with as much symbolism as Backman infers. Part of me wanted to cast the book aside as a problematic sequel what was already the weakest thing Backman has written. I continued because Backman has a knack for tossing off simple-yet-profound insights that make their way into the mouths of his characters. Why might someone distrust men in suits? Because people with ambition and money, “never love anything, they just own things.” Or how about this bon mot from Leo: “… people will always choose a simple lie over a complicated truth, because the lie has one unbeatable advantage: the truth always has to stick to what actually happened, whereas the lie just has to be easy to believe.” Ouch! How then to evaluate Us Against You? Maybe this doesn’t make a lot of sense, but I see it as a really great mediocre offering. It is, however, time for Backman to turn his attention to other matters. This is his third sports-based novel and even the best metaphors break if you flex them too often.